•To learn more about ‘S’ Models, click here. To download ‘S’ Model Installation Instructions, click here. MDC presents the first high performance stirrup for Pony Riders. The MDC ‘S’ Pony Classic™ combines our forward facing design, traditional styling and improved safety for our smallest riders. The 'S'Pony Classic™ is a wonder in engineering and rider safety. Aesthetically pure in design, as well as show ring legal for all competitions, the MDC 'S‘ Pony Classic™ brings advanced stirrup design to the World of Ponies. 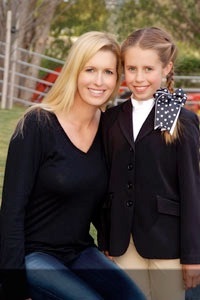 International Hunter Derby / WCHR Champion, Hope Glynn and her daughter, Avery.